After eating lunch with my father-in-law, I hiked up Blood Mountain in North Georgia. It was hot and very humid, but a great time for a Prayer-Hike. I do a prayer-hike on occasion which is simply going on a hike and praying along the way, talking and listening to the Lord. When I stop for a break, I also read Scripture. This time I read the different sections of Psalm 119. Hiking a mountain is great exercise!! You work every muscle in your body. I only wish I had closer mountains to hike!! A great man of God went to be with the Lord today. John R. W. Stott, the Anglican Bible Teacher and Scholar, finished his race today. Our world and the Kingdom have lost a tremendous servant of the Word, but thankfully, his life-work will continue to illuminate and teach Bible students and followers of Jesus for years to come. On a personal note, I have been deeply grateful for his insight and explanation of so many Scripture passages. Throughout the years he has taught me SO MUCH. I have been running (jogging) for over 40 years. Just found out I have been doing it all wrong!! Just read Born to Run by Christopher McDougall. A very interesting and fascinating read. I was blessed to know Guy Lytle for the past 20 years. I was on the search committee which hired him as the new Dean of the School of Theology of the University of the South in Sewanee, TN. As a Senior in the School of Theology, I had seen and experienced first-hand how Biblical Christianity was being trashed in the name of academic freedom and liberalism. I will never forget the Dean of Students complaining that they needed to offer more Bible courses because so many students wanted to study Bible. This was a seminary, right?? Guy once described himself as an evangelical, charismatic, anglo-catholic, scholar. And he was!! He had an incredible love for Jesus and Truth of His Word. He lived and ministered in the full power of the Holy Spirit. And Guy had a deep appreciation and understanding for historical and sacred liturgy in worship and daily life. His incredible intellect could process and synthesize, and yet discern spiritually any material put in front of him. For Guy to become the Dean of the School of Theology was like two worlds clashing -- and clash they did! But Guy was a pastor first and he often demonstrated first hand to students how to love, respond to, and care for those who disagree with you. He did not back down from his principles and from the teaching of the Word of God. Yet, he was full of grace and the love of Jesus. As his students will testify, Sewanee and each of our lives were better and more godly because of Guy Lytle. May his soul, and the souls of all the faithful departed, rest in peace. Amen. Summer is always a good time to get some down-time from work and ministry responsibilities. Everyone needs time to recharge their batteries, rest, spend some quite time with the Lord, catch up with family members spending time together, workout, take in a movie, and partake of a good meal. Jesus was often taking time to get away by himself and spend time with His Father. He had to get away from the crowds, the demands, and the clamor of public ministry. It not only gave him rest and time in prayer, it empowered him with clarity, purpose, and victory over the tempter. Take some time this summer. Spend some time daily with your Heavenly Father. Take a long weekend and spend it with family. If you can take a vacation, do so. Sabbath refreshes. Sabbath heals. Sabbaths strengthens. Sabbath empowers. To tighten up our security, we are verifying all active accounts, please verify your account as we will be suspending all dormant/unverified accounts. It then had a box to verify, and without thinking, I was exposed, and all of my 2800 contacts were exposed to a scam message asking to send money to me in England. For those who were scammed, my sincere apologies. I have been praying for the scammers -- that they would encounter the Justice of God. May they reap what they sow, and may God remember that he said, "Vengeance was His." For all us who have been touched by this, I am of confident of Romans 8:28 -- "that all things work together for good for those who love God and are called according to His purpose." Allison and I spent the Fourth of July in Atlanta. We began our day by running with 60,000 other people the Peachtree Road Race, a 6.2 mile (10K) tradition in Atlanta. I ran my first one in 1975, but for Allison, this was her 31st in a row. It was very hot and humid this year, even at 7:30 in the morning. I don't want to talk about times, but to say that it was privilege not only to be able to run, but to finish and enjoy the festivities. The Peachtree Road Race is really not a race (except for the first way of runners), it is an event. After a nice lunch and a movie, we strolled through Lenox Square Mall looking at shops, having a Chic Fil A peach milkshake, and reminiscing about our childhood days when Lenox Square was an open-air square, and then later when in high school, I worked for two years at the Lenox Square Theatre. In the evening, we took in another Atlanta tradition, the fireworks at Lenox Square. Over 150,000 show up every year to watch the 15-minute fireworks display celebrating the birthday of the United States. We watched in the rain! But all day long, I kept getting emotional when I would see the American Flag or hear the National Anthem. Someone posted on my Facebook page "The Story of the National Anthem," which I had never heard. Wow! To hear the story, click https://www.youtube.com/watch?v=vFXjoa6-p-.4&feature=player_embedded#at=41. O Lord God Almighty, in whose Name the founders of this country won liberty for themselves and for us, and lit the torch of freedom for nations then unborn: Grant that we and all the people of this land may have grace to maintain our liberties in righteousness and peace; through Jesus Christ our Lord, who lives and reigns with you and the Holy Spirit, one God, for ever and ever. AMEN. As we celebrate Independence Day in the United States, I am distressed in how far we have departed from the ethical base on which our system of Government was founded -- the Ten Commandments. Not only do we not practice them any more, we don't even teach them anymore. We have even made it a crime to post the Commandments on our courthouse and schoolhouse walls. O, how far we have come in the name of secularism and tolerance! What we don't realize is that our form of government will unravel without them. "We have staked the whole of all our political instituions upon the capacity of mankind for self-government, upon the capacity of each of us to govern ourselves, to control ourselves, to sustain ourselves according to the Ten Commandments of God." John Adams, our second president, and very involved in the framing of our Constitution said: "Our Constitution was made for a religious and moral people. It is wholly inadequate for the government of any other." This has been the ethos (mindset) of our country for most our existence. In the early 20th Century, President Calvin Coolege said: "The foundation or our society and government rest so much on the teachings of the Bible that it be difficult to support them if faith in these teachings would cease to be practically universal in our country." 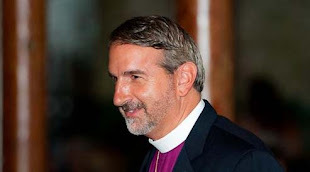 To hear more, you can listen to my Patriotic Sermon from today entitled, Have We Lost the Ethical Base of the Nation?, by clicking on http://www.holycrosspodcasts.org/C1-media;show,99.